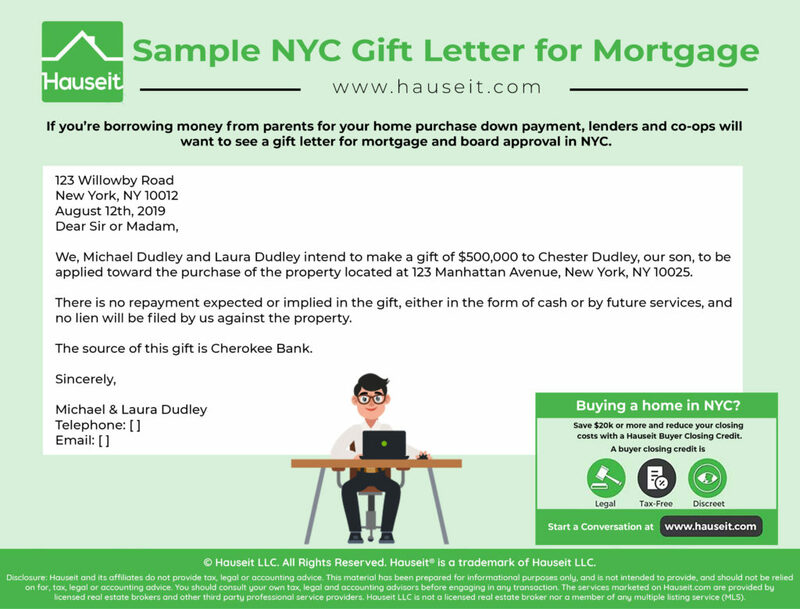 If you’re borrowing money from parents for your home purchase down payment, lenders will want to see a gift letter for mortgage approval in NYC. Many first time home buyers in NYC need a little help with their down payment. Often times parents or other family members will be able to step in to save the day. It’s important to keep in mind that banks today will want to see typically 2 or 3 months of statement history for your bank accounts. If your gift was received more than 2 or 3 months ago, then you will likely not need a gift letter. However, if the gift was recently received or if it is still in your parents’ account, then you’ll need a gift letter for mortgage to verify that the gift is bona fide and comes with no strings attached. Even if you’re purchasing a property all cash without a mortgage, a seller or co-op board may want to see a gift letter to explain your source of funds. This is less common when buying a condo in NYC, but should be expected if you’re buying a co-op in NYC.The co-op board will be reviewing all of your finances during the purchase application process and will want a gift letter if you’re receiving help from family members, even if you don’t plan on getting a mortgage. Feel free to write something more personal and informal if the gift letter is only for a co-op board or seller who wants to verify the gift. 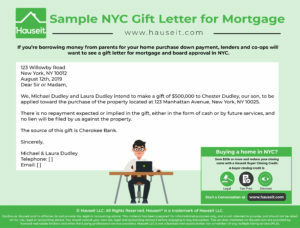 Please see below for a sample gift letter for mortgage for a New York City real estate transaction. We, Michael Dudley and Laura Dudley intend to make a gift of $500,000 to Chester Dudley, our son, to be applied toward the purchase of the property located at 123 Manhattan Avenue, New York, NY 10025. There is no repayment expected or implied in the gift, either in the form of cash or by future services, and no lien will be filed by us against the property. The source of this gift is Cherokee Bank. If the gift letter is for your mortgage lender, they’ll typically want to see something more formal on a standardized form like the one we’ve included below. Each section of the Gift Letter must be fully completed including dates and signatures of donor and recipient (borrower). Read this form carefully and be prepared to follow these instructions exactly. The location of funds must be indicated unless the donor is an immediate family member providing equity credit on the property being sold. This is a bona-fide gift, and there is no obligation, expressed or implied either in the form of cash or future services, to repay this sum at this time. The funds given to the homebuyer were not made available to the donor from any person or entity with an interest in the sale of the property including the seller, real estate agent or broker, builder, loan officer, or any entity associated with them. Documentation verifying availability, transfer, and receipt may be required. Review the Lenders Commitment Letter for any specific required documentation. Do You Need a Broker to Rent an Apartment in NYC?